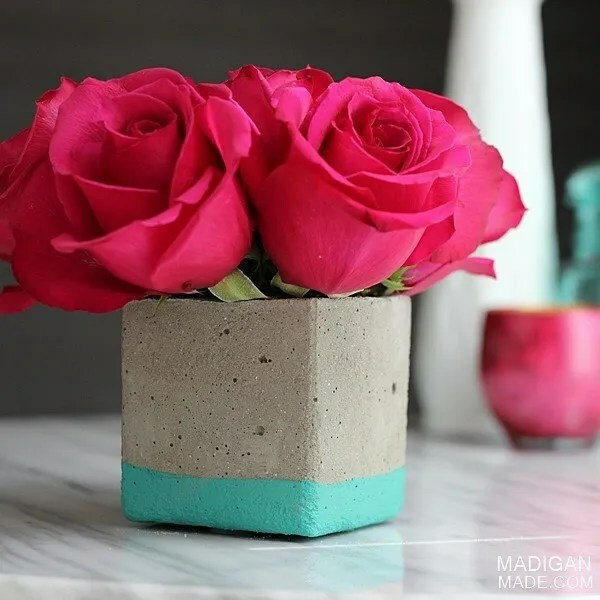 Madigan made… a square concrete vase. So, after yesterday’s paperweights, have I convinced you yet that concrete crafting can be easy, cheap and fun? If not, let me show you how to make this simple and modern vase. I’ve seen my share of DIY concrete planters online, but I wanted to create something small that I could use inside to hold flowers. Concrete is durable and can hold water if sealed. But it can crack… and I’m new to this concrete stuff so I was nervous using it alone to hold water for a vase. 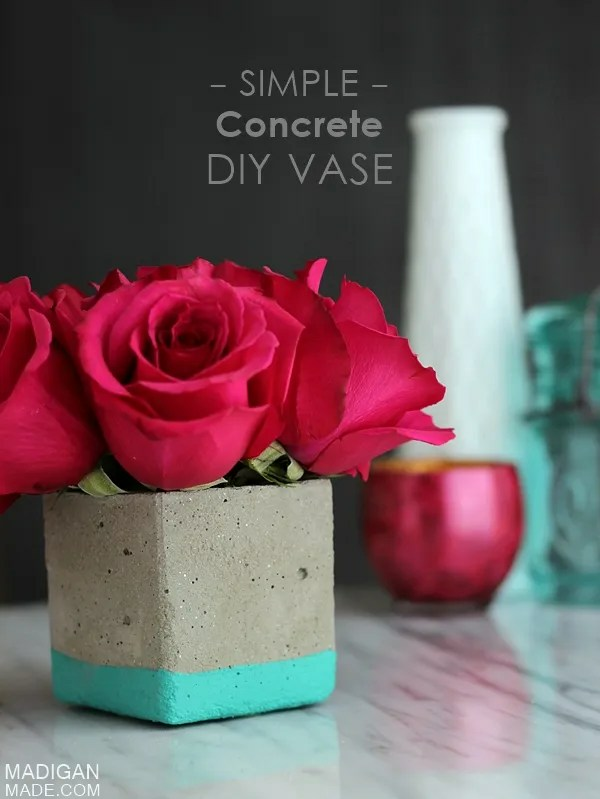 Then I saw this concrete vase idea by Sibylle from Funkytime. She embedded a plastic container in her concrete to make a vase. Bingo! Loved that idea! I chose to use a square shape and I decided to use a glass container for the inside of my vase. 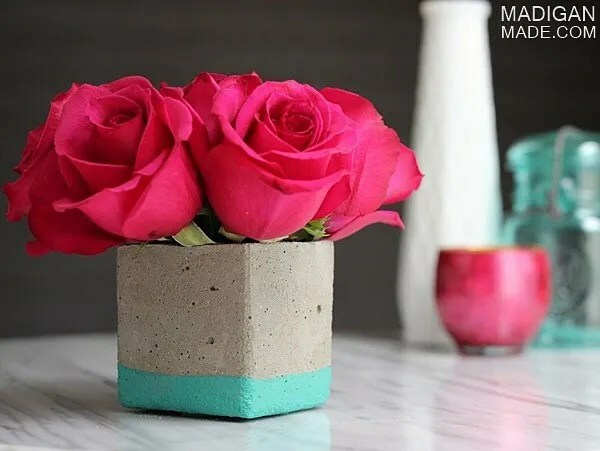 You can make a simple concrete vase, too! 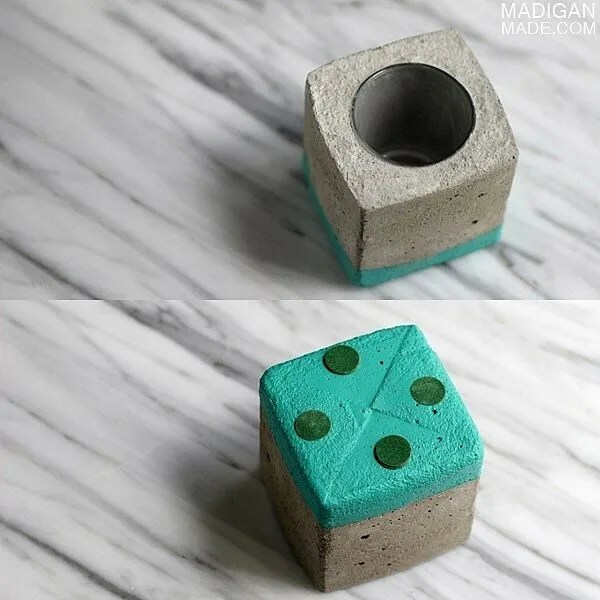 For detailed instructions, please check out my simple tips for crafting with concrete to get you started. I review a complete supply list, how to prep your area and tips create your concrete craft. For this project, we will be creating a hollow area inside the piece and I’ll show you how I did that. 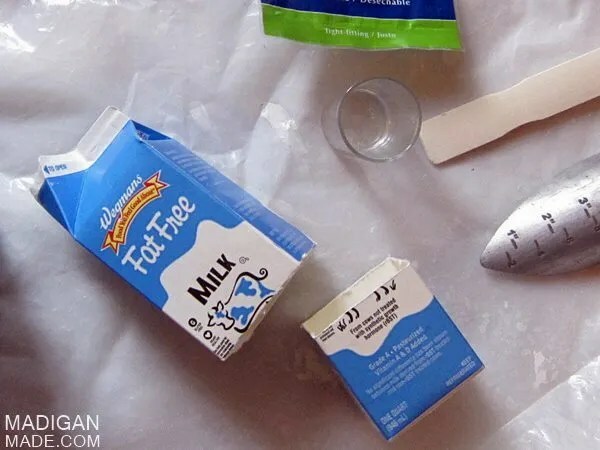 In addition to the supplies listed in that tutorial post, for this project you will need an empty and clean milk carton (cut down to make a square shape) and a glass vase or votive that will fit inside the carton. 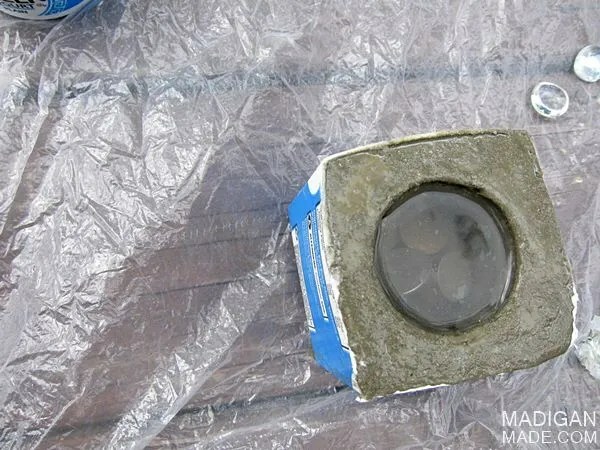 You will also need some coins or rocks to weigh the glass down in the cement as it dries. If desired, you can grab some craft paint, too. One tip as you make this project: fill your container slowly with the concrete. Fill the milk carton about half way full with your mixed concrete. 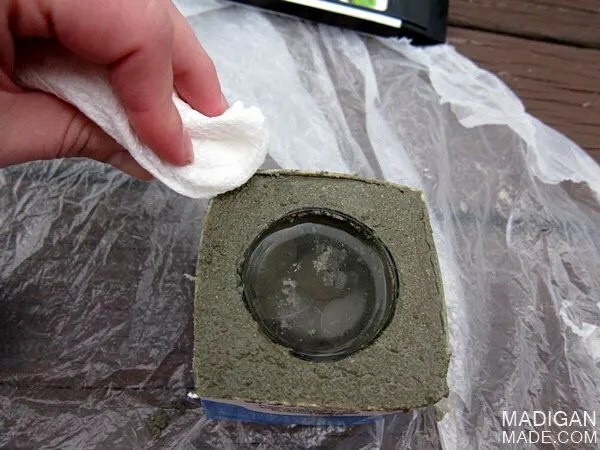 Press the glass votive into the carton to see if you poured enough concrete. Remove the vase and add a little more concrete to the carton if needed. You want the cement to JUST reach the top of the glass vase and the carton. If you overfilled, carefully brush away and smooth out the concrete so it is level with the top of the carton. After my concrete started to set up (an hour or two after I poured), I went back and used a towel to brush any concrete off the edge of the glass and smooth out the top of the concrete a little. After about 8 hours, I felt things had cured enough that it was safe to pour out the water and coins. I used that as an opportunity to clean out the inside of the glass, as needed, too. Once cured and removed from the carton, I painted the bottom and up the sides of the concrete to create a ‘dipped’ look on the vase. I just used a craft paint designed for masonry. To protect my tabletop, I placed velour furniture pads on the bottom of the vase. If you did not need to hold water you could follow the same process and use a small, disposable container for the center inset piece. Then, you can peel that part out and have a fun cement container for a planter or candles (like Kate did in this votive candle project). After I made it, I was anxious to try out my new vase, so I filled the inside glass with water and added flowers! I love the contrast of soft, organic petals against a hard, modern material. The little pop of turquoise on the bottom keeps it from feeling too heavy or serious. See, don’t you want to make a fun and easy vase, too? Learn how to create simple, elegant and affordable ideas for your home. Don’t miss a craft or DIY idea! Follow us on Pinterest or get Madigan Made in your email inbox for FREE!